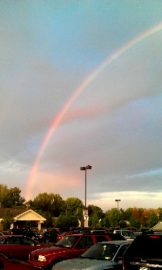 You know, one would think that with all the rain we get in this area that we’d have more rainbows. Yet, for whatever reason we don’t, so we were pretty amazed a couple of weeks ago when rainbows appeared in the area after a particularly rainy period for us. They showed up in the early evening, and they were big. I’m using “they” because if you can see clearly enough you’ll notice that there was a double rainbow at some point. The one large one seemed to be moving from time to time, and that makes sense since I was taking the pictures while driving; yeah, I know, one’s supposed to be concentrating while driving, but I didn’t take the pictures until I stopped each time. I got a couple of shots in the Wegmans parking lot on Route 57 as well. What’s even more amazing is how people reacted to seeing them. 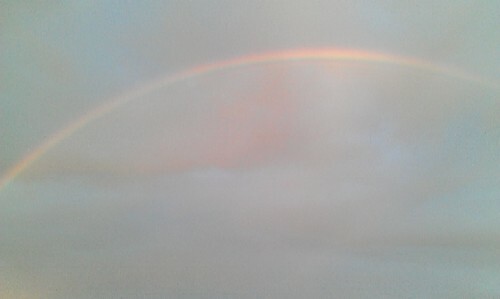 At first I felt like a rube that had never seen a rainbow, but there were lots of people standing in the parking lot, either by their cars or off somewhere, staring up at these things, some people taking pictures like my wife and I, others just marveling at it all. For once a short post so I can just shot a few pictures that I liked that came out pretty good from someone who’s not a photographer at all; I hope you’ve enjoyed them, and of course you can enlarge them to see them better. Beautiful, and somehow I missed them! 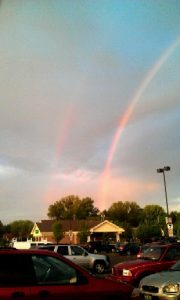 Rainbows are very special to me and my husband and we stop whatever we’re doing to look at them whenever we see one.